Nubra Valley, Ladakh. 30 kilometres ahead is Siachen, world’s highest battle ground. But what catches your eye is the ethereal beauty of a cold desert – white sand at a height of more than 10000 feet. Between the dramatically positioned Diskit Monastery and Hunder, the erstwhile capital of Nubra Valley, you encounter double humped Bactrian camels. They are the living heritage of world’s greatest trade route, the Silk Road. For more than two millennia, this had been the most important highway in the world. There was, however, no single road called the Silk Road – it was basically an almost 7000 kilometre long trade route linking all the ancient civilizations - China, India, Persia, Egypt and Europe. The route used to start from deep inside present day China and come in a few parallel tracks up to Kashgar (present Xinjiang province, China) and then bifurcate into a northern route and a southern route (Ladakh was on the southern route) and then again meet at Merv (present Turkmenistan). It used to continue up to the coast of Turkey and Jordan from where goods used to be taken to Europe through sea (or to Egypt and then by sea to Europe). Chinese silk reached Europe through this route, prompting the name. But silk was just one of the famous items on the route – equally famous were Indian ivory, spices and textiles; horses, precious stones and other high value items. No caravan used to travel the entire length of the road – at fixed points they used to sell their goods to the next group of traders. By the 5th century BC, Persians already established a 3000 km long road from their capital Susa (present Iran) to Izmir (present Turkey). The route to Central Asia opened up with the invasion of Alexander in 329 BC. He established Greek power over Egypt, Persia, parts of Central Asia and North-Eastern India. For the next three centuries, Greek rulers controlled most of this region, providing a seamless connection to Europe. 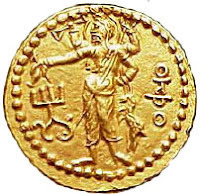 Gold, Silver and wine came from the West in exchange of ivory, silk and spices. In next 200 years, under the Han dynasty, the Chinese expanded into Central Asia and thus provided the connection towards the East. Roughly from the first century BC to around 1400 AD the Silk Road enjoyed unparallel prosperity. The last great empire of the Silk Road was the Mongol empire of Chengiz Khan. As this empire gradually disintegrated in the course of the 15th century, the unity of the Silk Road also broke down. With the opening of direct sea routes, Silk Road lost its relevance. India was at the centre of this exchange and it brought great prosperity to the subcontinent. Confluence of ideas from East and West led to the establishment of World’s first university at Taxila (3rd Century BC). Kushans, coming from their Central Asian homeland, established one of the greatest empires on the Silk Route, covering large parts of Central Asia and northern India. For India, perhaps the greatest legacy of the Silk Road is the dissemination of Buddhism. Under their greatest ruler Kanishka, who ruled from Purushpur (Peshawar) and Mathura, this empire helped in spreading Buddhism far and wide. Important cities on this route – Khotan, Kashgarh, Yarkhand became important centres of Buddhist learning as well. As borne out by recovery of important artefacts and texts in Khotan and other places, Buddhist Viharas along the route seem to have attained great prosperity both in terms of material wealth and religious texts and relics. Some of it are still preserved in monasteries of Ladakh. Famous Chinese pilgrims Fa-Hsien and Xuanzang (Hieun Tsang in Indian history) came by this route. After the seventh century, Islam spread through this route. The curse of medieval Europe, Black Death (Bubonic Plague) reached China through this route. Also travelled through this route knowledge of medicine, astrology and scientific discoveries. 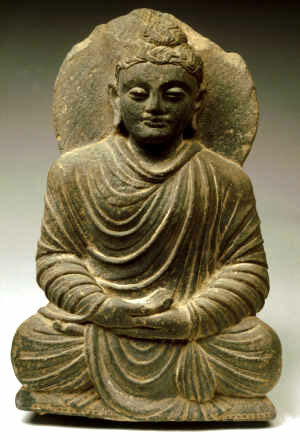 Influence of the Gandhara art, which took shape under the Kushans from the twin influence of Indian and Greek traditions, also spread with the Buddhist philosophy. 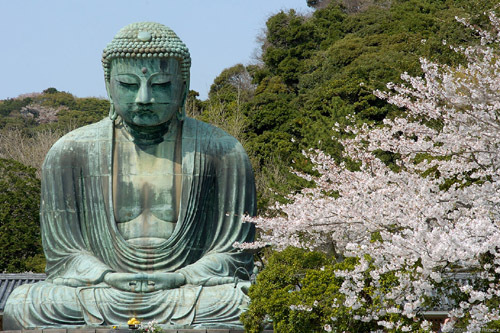 The famous Buddhist statue at Kamakura, Japan (9th Century AD) bears unmistakable signs of the Gandhara style. Silk Road is currently the flavour of the season in international relations. USA unveiled its vision of regional economic integration through this “New Silk Road” initiative a few days back in the Istanbul Conference. This Conference on the future of Afghanistan, stressed on this vision, where Kabul should be at the crossroad of global commerce rather than global terrorism. UN Secretary General Ban Ki Moon would be addressing another similar international conference later this month in Kazakh capital Almaty. In an unrelated development, Governor of China’s Xinjiang province, Nur Bekri recently visited India. Trade has a great power to transcend all barriers. After all, present political boundaries are there for just a century whereas this exchange had been there for millennia. If a traveller from Xinjiang is able to come just south of the boundary to Ladakh then he would be easily able to identify with the paintings at Ladakh monasteries. In one of his receptions, the visiting Governor of Xinjiang must have been offered a stuffed fried pastry, which came to India many centuries back from Xinjiang. We call it Samosa from the Central Asian original Samsa.